This guide will help you find and evaluate current and historical news items. The United States Military Academy Library at West Point has access to a large collection of newspapers published in the United States and around the world. 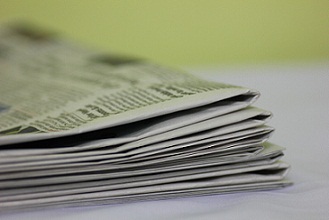 Current and historic newspapers may be available online, in paper and on microfilm. This guide was designed to help you navigate news sources and identify ways in which to evaluate your findings. Current information: Up-to-the-minute events and trends. Historical information: Past events and issues. Learn about perceptions from times past. Reviews: of books, movies and cultural information. Please note this is not a complete list of sources and remember, news items are not considered scholarly sources, so be sure to check with your instructor before using them for a paper. Search, then limit by "News Sources" to find news articles. While many newspapers have been digitized, some are only available in microform. Microforms contain reproductions of newspapers, magazines, books, and other materials, They are used to preserve content that may decay over time. Microforms are located in the periodical room on Floor 2 / East of the library. Microfilm readers are located right next to the cabinets containing the film. Questions? Just ask, and we will be happy to show you how to use the Microfilm reader.